Each year at the Seder, Jews read this line in the Passover Haggadah, "In every generation, a person is obligated to see themselves as if they had left Egypt." This concept reminds us that each year we must approach the haggada with a fresh eye. It demands that we not merely read the words, but understand them afresh. We must have both empathy for what our forefathers and mothers have suffered, and – more importantly – be aware that change is possible, that we are masters of our fate, and that with determination and courage we can accomplish liberation. In our generation, liberating Israelis and Palestinians from the yoke of the occupation, which is subjugating both societies, is imperative. And it is within our reach. 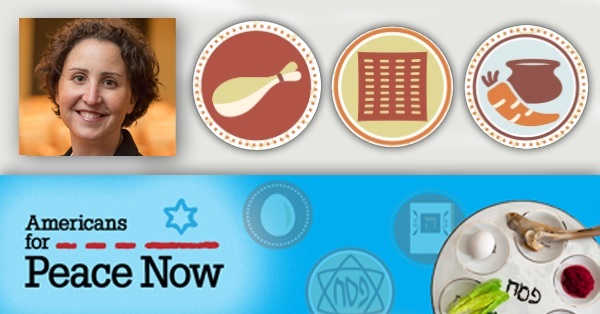 This year, you can add flavor to your seder by sharing this thoughtful reflection by Rabbi Rachael Bregman. Rabbi Bregman has graciously contributed our 18th haggadah insert. In it, she asks us to reflect upon what questions we want to ask this year, offers questions for the table - to be asked when we reach the explanation of the three symbols of Passover: pesach (the offering), matzah and maror. Rabbi Rachael Bregman is the Berman Family Rabbinate Rabbi at Temple Beth Tefilloh in Brunswick GA. She is the first female rabbi in the synagogue's 130 year history and the first resident rabbi in over fifty years. She is a Rabbis Without Borders Fellow, sits on the board of FaithWorks and likes to compete in Tough Mudder races. She lives in Brunswick, Georgia with her daughter and her rescue dog.